During main celebrations for the Russian Fleet’s “Navy Day”, the Andreevsky flag was ceremonially hoisted over the flagship vessel for the new generation of Project 18280 ‘Yuri Ivanov’-class of ships at the Baltic Fleet’s primary base. The new vessel has successfully completed factory and state trials. Preparations are now underway to transfer the ship to its permanent base, at one of the Northern Fleet’s bases on the Kola Peninsula. The ‘Yuri Ivanov’ is called a communications ship, though in reality it is a reconnaissance vessel. Among its tasks are supporting communications and fleet management, radio reconnaissance and radio-electronic warfare (REB). The ship’s primary role is as a reconnaissance vessel, monitoring aspects of the American missile defense system. The onboard equipment it possesses can detect radio signals across a wide range of frequencies to determine the location of their source. The exact composition and types of apparatus on board have not been publicized for obvious reasons, given the ship’s specialization. What is known is that a multiband radio reconnaissance and monitoring system and a system to collect information on potential enemy radio-technical equipment has been installed on board. The vessel is also equipped with a multi-spectrum reconnaissance system, and can monitor a large number of signals of varying capacities across a variety of ranges, not only to locate but also to analyze their origins. This new system can and will monitor the strategic weaponry of foreign states, including interceptor missiles and the ballistic missile-targets. It will also have the capacity to control the launch of intercontinental ballistic missiles, including those originating from submarines and space missile carriers. Additionally, it will not be possible to hide even trials of any potential models of strategic weapons from the ‘Yuri Ivanov’, if foreign states choose to conduct them. Hypersonic aircraft and high precision weapons like warheads or guided missiles with various types of bases in planning will be “seen” and detected by the system, which will duly transmit such information to the Russian military command in a timely manner. ‘Yuri Ivanov’ is not the Russian fleet’s only reconnaissance vessel. “There were also reconnaissance ships in the USSR. During the Cold War, they were stationed in neutral waters and conducted surveillance from the area where the potential enemy was training,” explained Vladimir Shcherbakov, editor of the journal Independent Military Review. In the Soviet Navy, similar missions were conducted by measurement complex ships (KIK), which handled the monitoring of the flight parameters of ballistic missiles at various trajectory segments. KIK vessels not only controlled the launch of domestic missiles, but also maintained vigilance and monitored launches of foreign spacecraft. In the 1960s, the measurement ships extracted information about the American high altitude nuclear explosions. These ships were also called the USSR’s space fleet. Only one of these measurement ships remain today; the ‘Marshal Krylov’. In 1998, the ‘Marshal Krylov’ became a communications ship. It was upgraded in 2012 and now monitors the testing of Russian missile weaponry on the fleet as well as supports the flight-design testing of space apparatus and missile carriers. 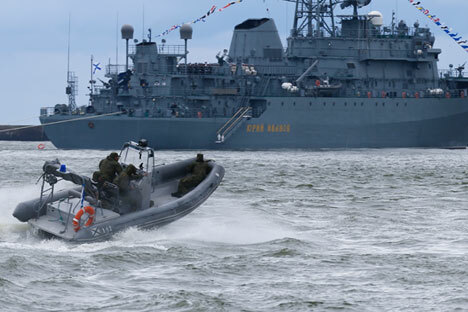 However, the political situation has changed over time and radio reconnaissance technology has improved, so the fleet developed requirement for a new generation reconnaissance vessel. “Considering the buildup of the American missile defence system not far from Russia’s border, the priority is now being given to tracking the mobile component of the US missile defence system, ‘Aegis’. It specifically will be monitored by the ‘Yuri Ivanov’,” said Shcherbakov. The ‘Yuri Ivanov’ has become the largest reconnaissance vessel ever in the Russian fleet. It is five metres long and 16 metres wide, with a (water) displacement of 4,000 tons while being equipped with the most powerful instrumentation for electronic intelligence gathering. With time, these “spy” ships will become larger: the second Project 1820 ship, ‘Ivan Khurs’, has been laid on the building berths at the Northern Shipyard. The plan is to build at least four such ships. After the Northern Fleet, Russia’s Pacific Ocean, Baltic, and Black Sea Fleets will be enhanced with these vessels.